We’d love your help. Let us know what’s wrong with this preview of Jack of Kinrowan by Charles de Lint. Jack of Kinrowan An acknowledged classic of contemporary fantasy, Jack of Kinrowan brings together in one volume Charles de Lint's rollicking saga of wild faerie magic on the streets of the city. Hurled into the mythical land of Faerie by a faceless gang of bikers, young Jacky Rowan is stunned when she is immediately hailed as the legendary hero Jack of Kinrowan and direct Jack of Kinrowan An acknowledged classic of contemporary fantasy, Jack of Kinrowan brings together in one volume Charles de Lint's rollicking saga of wild faerie magic on the streets of the city. Hurled into the mythical land of Faerie by a faceless gang of bikers, young Jacky Rowan is stunned when she is immediately hailed as the legendary hero Jack of Kinrowan and directed to save the land from a treacherous evil force. Jack, the Giant Killer: A faceless gang of bikers on Wild Hunt through the streets of present-day Ottawa hurtles young Jacky Rowan across the threshold into the perilous land of Faerie. There, to her dismay, she is hailed as the Jack of Kinrowan, a once-and-future trickster hero whose lot is to save the Elven Courts from unimaginable evil. Drink Down the Moon: Once the realm of Faerie drew its power from the Moon herself. But now a ghastly creature has stolen that power and enslaved the Fair Folk--and Jacky Rowan herself. Only Johnny Faw, a handsome fiddler unaware of his magical gifts, has the power to set them free. To ask other readers questions about Jack of Kinrowan, please sign up. Apparently there is a first book to this one? What is the name and should I read it before this one? Dianne Sheffield There is actually not a book before this one. This was a two book series and this one actually has both starting with the the 1st book. In Jack the Giant Killer, the first of two novellas in this book, Jacky Rowan has just realized that her life is not going where she wants it to go. She drifts along, refusing to take care of her life and just staying at home doing nothing. She decides to change her life after a nasty breakup. In a fit of pique, she goes out drinking alone. Staggering home, she sees a little man being chased by 9 men on motorcycles. She tries to help him, but the little man is killed. She runs to a nearby house In Jack the Giant Killer, the first of two novellas in this book, Jacky Rowan has just realized that her life is not going where she wants it to go. She drifts along, refusing to take care of her life and just staying at home doing nothing. She decides to change her life after a nasty breakup. In a fit of pique, she goes out drinking alone. Staggering home, she sees a little man being chased by 9 men on motorcycles. She tries to help him, but the little man is killed. She runs to a nearby house to try to get help, but no one answers the door. She runs back to where the little man's body was, only to see it disappear, leaving behind only a red cap. The next day, she almost convinces herself that the alcohol was just making her see things that weren't there, but she can't explain where she got the cap from. She puts it on and starts to see people straight out of Faerie. She eventually finds out that the Unseelie Court has been getting stronger and stronger and has actually stolen the local Laird's daughter. The Seelie Court is so weak that everyone is afraid to go in search of the poor girl. Jacky decides to just go looking herself. With a hob's stitcheries giving her invisibility and swiftness, the help of her best friend Kate, and a whole heap of a Jack's luck, Jacky sets out to set the local Faerie courts to rights. I loved how Jack becomes Jacky in this story. Who says women can't be clever, lucky tricksters? She fills the role of Jack perfectly, coming up with ingenious solutions to problems and avoiding pitfalls in the tradition of the best fairy tales. I also loved how Jacky reached out and took control of her life. It obviously can be done, but it's usually easier to just keep going with the flow. It takes real bravery to make a real change. What I have always loved about Charles de Lint is the way he weaves fantasy into modern life. Yeah, urban fantasy is common now, but de Lint was one of the earliest authors in the genre. Reading this for the first time years ago, I loved how urban Faerie have developed a tolerance for iron. And why wouldn't the Wild Hunt appear on Harleys? This is taking place in the 20th century after all. I just liked the idea that there is more to the world than meets the eye, and fairies are not fragile creatures who can only survive in the wilds. They would have to be adaptable. I love Charles de Lint because of his characters. I can't say that Jacky and her friend Kate are some of my favorites, but I do love to read about their friendship. They are silly and brave and honest with each other, and neither would ever abandon the other. The other novella, Drink Down the Moon, was not as strong for me. Jacky has gotten a little over-confident and makes some big mistakes. As a result, an evil force has wrought havoc on the wild faerie and has started causing big damage in her area of Faerie, Kinrowan. Kate is the true hero who realizes what's going on and starts acting on it. There are two parallel plots throughout most of this story. I was most interested in Jacky and Kate's story. On a straight read, it gets a little old to read about the humans Johnny and Henk going through the same bewilderment that Jacky and Kate went through as they adapted to Faerie in Jack the Giant Killer. The books were published years apart and reprinted together later, so that's not entirely de Lint's fault. The wild faeries that Johnny and Henk stumble onto are a little too belligerent and blood-thirsty for my taste. They have been through a lot, but it's not the humans' fault. I did like mercurial Jemi and her relationship with Johnny, but the rest were very angry and bitter. I wish Goodreads allowed half stars because I think this book is really a 3.5. Jack the Giant-Killer retells the Jack motif from folklore. de Lint has a good twist by making this Jack, a Jacky. The strange thing it that the more interesting character, for me at least, is her friend Kate "Crackernuts" Hazel. Kate seems to be more of a living character. The story makes wonderful use of fairy motif and allusions (and what de Lint book doesn't). The one weak spot was that romance, in particualr the c I wish Goodreads allowed half stars because I think this book is really a 3.5. Jack the Giant-Killer retells the Jack motif from folklore. de Lint has a good twist by making this Jack, a Jacky. The strange thing it that the more interesting character, for me at least, is her friend Kate "Crackernuts" Hazel. Kate seems to be more of a living character. The story makes wonderful use of fairy motif and allusions (and what de Lint book doesn't). The one weak spot was that romance, in particualr the closing pair, seemed not so much forced, as put in the belief that readers want it. The two books contained in this omnibus edition are about Jacky and Kate, two ordinary Ottawa women who get drawn into the machinations of Faerie. Definitely not my favorites by de Lint. Charles De Lint is a fairly well known name among urban fantasy authors and seems to be highly regarded. As I've read most of the books by his contemporaries (Emma Bull, recently, but I'd also include Tim Power and James Blaylock amongst that list) it seemed like someone worth trying at some point, especially since he has a decently fervent fan base. 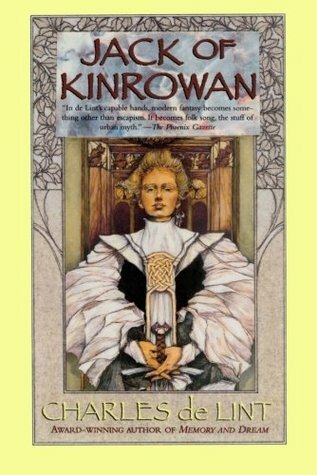 This is an omnibus of sorts, collecting two novels based around the same character, Jacky Kinrowan, a young woman recently reeling from a breakup wh Charles De Lint is a fairly well known name among urban fantasy authors and seems to be highly regarded. As I've read most of the books by his contemporaries (Emma Bull, recently, but I'd also include Tim Power and James Blaylock amongst that list) it seemed like someone worth trying at some point, especially since he has a decently fervent fan base. This is an omnibus of sorts, collecting two novels based around the same character, Jacky Kinrowan, a young woman recently reeling from a breakup who decides to cut her hair and fall into the world of faerie, in that order but not intentionally so. Along the way she finds she has to deal with the Seelie and Unseelie Courts and their endless war against each other, navigate her role as "The Jack" despite the fact she has no magical abilities although she does have the accidental luck of Inspector Gadget on her side. Oh, and she's Canadian, which means she's probably nicer than anyone you know. These are somewhat early novels by De Lint but not super early in his career (apparent beloved fan favorite "Moonheart" was published almost three years before the first novel here, in 1984) and they definitely come across as a combination of someone still figuring out his style and a collection of moments that remind you of other, better moments in other fantasy novels (even ones that were done later). In De Lint's world, much like a lot of other fantasy writers, the faerie world exists alongside ours but can't really be seen but once seen brings the protagonist into a world of magic and wonder and danger that involves them in a situation they don't ask for but with a variety of pluck and friends in the right places, they manage to overcome all the stuff that should be working against them. The problem is that a lot of it feels weightless, without much depth to it. Problems abound from the opening scenes of "Jack, the Giant Killer", where a boyfriend bereft Jacky witnesses the Wild Hunt, a bunch of guys on motorcycles, which only reminded me of a similar and more effective scene in Matt Wagner's comic series "Mage". It doesn't take long for Jacky to get involved in a rescue situation where she has to save the daughter of a powerful ruler from the Unseelie Court, enlisting the help of new friends in the process and relying on the fierce sassy attitude of her best friend, Kate. De Lint has clearly done his research and even if he does get bonus points for setting the action in Ottawa of all places, there are times when it seems that the story exists to depict the various members of the world of faerie and give us reasons to go meet them all, leading eventually to slight "plot coupon" feel, where Jacky has to collect the new magical object or talk to the next interesting person to move forward in her plans, most of which seem to fall into place by happenstance anyway. She comes across as nice and willing, but innocuous (with the hint of romance between her and another faerie oddly chaste and lacking almost all chemistry anyway) so for the most part you're more impressed at the scenery, as the parade of various denizens of the mystical realms appear to either help or harass poor Jacky. The problem is that De Lint often has a hard time making this feel magical. Where a John Crowley can imbue such a situation with a dreamy weight that feels like a half-remembered dream or Neil Gaiman can impart a feeling of impending lost innocence and deadly menace, De Lint mostly plods along without breaking a sweat too much, relying more that we want to see Jacky succeed because her and Kate are nice people and the other court is capital E evil than anything anyone does or earns. While he gets credit for including two women as lead characters, stripped of any sense of the personal that the best fantasy can have (whether it's Matt Wagner basically writing a metaphorical version of his autobiography in "Mage" or Emma Bull constructing a version of her life that never existed in "War for the Oaks" and making it feel real through her connection with the music scene) you're left with a story where the magic is all in the funny names and bizarre situations. While Jacky does her best to struggle it never feels like anything is at stake in the same way that "War for the Oaks" where the decision to stick it out versus running for her life felt like a choice with real consequences for everyone involved. It all lopes along easily but the closest it comes to actual magic is the character of the gruagargh, the only person that seems to have a sense of weight and age and mystery that the rest of the novel seems to lack, the hint that there are mysteries that can't be explained and probably won't be, something that "Little, Big" and even Holdstock's "Mythago Wood" seem to do effortlessly. The only thing effortless seems to be the climax which achieves Gaiman levels of "But it's the journey that's important, right?" But it's a pleasant read, even if it's not super memorable. Unfortunately once the shock of the new wears off, you're left with another story in pretty much the same style when he returns to the characters for "Drink Down the Moon". Jacky and Kate have roles in their new jobs but for the most part the story focuses on new characters, a fiddler that gets caught up in events when someone tries to steal the power of the moon, and a friend who is half faerie but has a sister who is fully in the realm of faerie. De Lint spends too much time focusing on them and not enough on what could be the far more interesting story, Jacky screwing up her first real crisis and all the consequences that stem from that, and how everyone has to deal with the fact that the girl in charge they're all trusting to solve their problems doesn't have the slightest idea what she's doing. But again it all slides down easily, as everyone romps around in situations that don't hold any surprises. As lacking in inner lives as Jacky and Kate are at times, Kate's wacky best friend shtick is light years more entertaining than the often colorless supporting characters that the novel introduces. Even the villain, who is supposed to be dangerous enough to ruin everything, holds none of the mystery and swaggering menace that he barely gathers to himself before he's revealed and afterwards isn't much better than a B-grade villain ranting and raving (his one trick, briefly taking Jacky out of the picture, isn't something he apparently is able to repeat even after he's in a position to do it again), giving everyone time to fumble together a way to stop him. And once again, the climax comes far too easily and quickly, ending it on a note so lightweight you might find yourself wondering if you somehow missed the climax (a variation on "music brings out the real magic" done far better and more viscerally in the rock and roll oriented "War for the Oaks"). I liked this book. It’s rough around the edges — apparently it’s one of de Lint’s earlier works — but it’s a great adventure, just the same. Jacky Rowan is the main character in this collection of two novels. She’s a “Jack” in the old sense of the word; she’s full of tricks and a lot of luck. If you’re a fan of de Lint, you know what comes next. Faeries are everywhere and they’re under attack. Jacky wants to help... but is she lucky enough for THIS? I'm a sucker for old-school fantasy and this fit I liked this book. It’s rough around the edges — apparently it’s one of de Lint’s earlier works — but it’s a great adventure, just the same. I'm a sucker for old-school fantasy and this fits the bill. It's a romping adventure that features faerie, biker gangs, and god-like fiddlers. I recommend to anyone who loves urban fantasy. Charles de Lint is one of the pioneers of urban fantasy. This book, set in Ottawa, Ontario, Canada is a brilliant trip into this genre. I absolutely devoured this book in just a few sittings. The characters are likeable, the story is rich, and de Lint's style makes it easy to get into and tough to put down. I live in Ottawa so the areas described in the book are well known to me, however, de Lint is brilliant at making you know the area the story takes place. This is simply a great trip into a gr Charles de Lint is one of the pioneers of urban fantasy. This book, set in Ottawa, Ontario, Canada is a brilliant trip into this genre. I absolutely devoured this book in just a few sittings. The characters are likeable, the story is rich, and de Lint's style makes it easy to get into and tough to put down. I live in Ottawa so the areas described in the book are well known to me, however, de Lint is brilliant at making you know the area the story takes place. I thought I’d found all the magic worlds I could love and believe in but this book proved me wrong. It feels like it wasn’t written by a man and I mean that as a compliment since the protagonists are women. He did well. One of the best of the best. This book was my introduction to the writing of Charles de Lint. One of the very best authors ever. I started with his Jack of Kinrowan and then read Moonheart and ... never left. I enjoyed these two books, but was very disappointed in the ending. Still, I’ll read more from this author. I'm re-reading all the Charles de Lint books I own and setting them free through BookCrossing. I had high hopes for this book and was greatly disappointed. I will admit I’m a huge fantasy fan, but haven’t explored too much urban fantasy. Now normally I would question why fairies, hobs, and other mythical creatures—usually associated with the earth and Mother Nature—would be living in a polluted, crowded city and if mythical creatures did dwell in a city, I would imagine them to be more fiendish, evil type creatures. However, I was willing to put aside my initial biases and see where Charles de Lint took the novel. He did not take it far. It seemed he only put in the urban elements to make the reader relate to the physical area (Ottawa, Canada) and the human world, as well as to be original. There didn’t seem to be much difference between the human characters and the magical characters. The evil monsters were just giants who rode Harleys. The magical characters ate at restaurants and at the Waffle House and spent human currency. Jacky and Kate were able to see the Faerie world, become invisible to fellow humans and members of the Faerie world, as well as run amazingly fast, just by having a hob sew some stitches into their coat and shoes. It seems to me if you’re going to have an urban fantasy setting, there should be some point—an environmental critique, humans’ ever growing need to develop the natural world, therefore forcing the mythical folk to live in cities, etc. However, de Lint doesn’t seem to be making any point. The story is very formulaic, with flat, good versus evil characters and no one in between. When Jacky—the main character—realizes the magical world exists and how the Seelie court is being brutally attacked, she is able—with no magic of her own and no forethought and planning—to defeat the Unseelie court, when for years the great wizards, lords, Gruagaghs, could do nothing to stop them. De Lint tries to show that through bravery and willingness to sacrifice yourself for the common good you can defeat your foe. However, this coming of age story is very childlike, shallow, predictable, and lacks stimulation. If you’re a youth and new to the fantasy genre, this might be a decent book, otherwise I would steer clear. I gave this book two stars only because some of the ideas in the novel were interesting, even if they were not fully developed. Such as: 1. There are supernatural beings that live among us, but because we don’t believe in them we have lost the ability to see them 2. That humans have a great tendency to believe in the bad supernatural creatures (ghosts, undead, witches, etc.) versus the good (fairies, elves etc.). This is one of my favorite Charles de Lint books. Yes, you will find the familiar formula of a young woman who, at first, feels uncertain about herself and her life, but then goes through a period of growth and transformation by embarking on a journey of sorts, making friends and enemies along the way, and then defeating a force of darkness in the final showdown. But there's a reason you see this formula in a lot of literature: it's a basic metaphor for what we all go through again and again at This is one of my favorite Charles de Lint books. Yes, you will find the familiar formula of a young woman who, at first, feels uncertain about herself and her life, but then goes through a period of growth and transformation by embarking on a journey of sorts, making friends and enemies along the way, and then defeating a force of darkness in the final showdown. But there's a reason you see this formula in a lot of literature: it's a basic metaphor for what we all go through again and again at various stages in our lives. Though our experiences don't (usually) involve elves, boggarts, magicians, and wars between faerie courts, it isn't entirely less frightening to deal with malicious office gossip, illness, betrayals of friends, difficult bosses, identity theft, domestic abuse, lawsuits, divorce and car accidents. There's a reason, too, why these stories are so appealing for many: through these characters' struggles, mistakes, and self-doubts, they do the right thing in the end, and ultimately discover more strength and wisdom within than they knew they'd possessed. In the midst of one's own perilous, harrowing, uncertain trials, it can be very reassuring indeed to find and connect with someone like Jackie, de Lint's heroine. De Lint is a master at telling these kinds of stories, where folklore is blended seamlessly into a modern setting filled with adventure, wit, magic, bravery, heart, and just enough grittiness, darkness and danger. His main characters are flawed but likable, and, whether they try or not, don't quite fit into the mainstream. It makes reading this, and many of his other stories, both satisfying and entertaining. But not to worry: your teeth won't hurt afterwards from too much sweetness. It's ironic because, across the board, I like CdeL's short stories better than his novels. But this book is made up of two novellas and I wish they were longer -- particularly the first which I think could have easily been book length all by itself. It's also funny reading CdeL again now -- however many thousands of urban fantasy novels later and remembering when what he was doing seemed so unusual and creative. He's kind of the granddaddy of it all, or one of them anyway. There's an indescribab It's ironic because, across the board, I like CdeL's short stories better than his novels. But this book is made up of two novellas and I wish they were longer -- particularly the first which I think could have easily been book length all by itself. It's also funny reading CdeL again now -- however many thousands of urban fantasy novels later and remembering when what he was doing seemed so unusual and creative. He's kind of the granddaddy of it all, or one of them anyway. There's an indescribable quality about his work -- a something more. It's not just magic and vampires and werewolves all running around New York or St. Louis of LA or [insert urban setting of choice here]. It's this sense that he buys into the idea on some greater philosophical level -- that there's some greater good at stake that requires the presence of Other Things in places besides Ye Olde Fantasye Land which is always basically rural England in disguise. I'm not just making him $7.99 richer by buying his book. I'm taking stand on behalf of that something more, making a conscious decision to see the magic in the world -- and the way into all this is through street musicians and artists and people who are way cooler than I'll ever be and some how manage to have great apartments and enormous book collections even though they have no discernible source of income. So clap if you believe in fairies! As a teenager, that was all irresistible. As an adult, I'm not sure. Sometimes not wanting to grow out of something doesn't change the fact that one has. I wish there were half starts because I would give this 4.5. I really enjoyed the first book in this two book edition. I love other books by Charles de Lint, he is a master of urban fantasy. This book is no exception. The story really snares you in in the first few pages. A humanbeing transported into a world of fairie, but still taking place in Ottawa. Jacky Rowan having just broken up with her boyfriend stumbles on a group of otherworldly bikers beating up a strange old man in the park. She tr I wish there were half starts because I would give this 4.5. I really enjoyed the first book in this two book edition. I love other books by Charles de Lint, he is a master of urban fantasy. This book is no exception. The story really snares you in in the first few pages. A humanbeing transported into a world of fairie, but still taking place in Ottawa. Jacky Rowan having just broken up with her boyfriend stumbles on a group of otherworldly bikers beating up a strange old man in the park. She tries to save him but is unsuccessful. This encounter throws her into an adventure she never expected to have, but definitely needed to experience. I really liked Finn and Jacky, and of course Kate was an interesting addition. I definitely wanted to know more about these characters by the time I finished the first installment. I've read the first novel in this set of two novels a couple times now, once years ago, and then a couple weeks ago, since I checked out the omnibus, and I needed a refresher to read the second. The book was written before Harry Potter, and the author's take on the magical world is thus unaffected by the mindset of the Harry Potter books. Instead of a escape into the magical world, this one is just as nitty gritty, full of courageousness characters, who need someone to step in and save them. The I've read the first novel in this set of two novels a couple times now, once years ago, and then a couple weeks ago, since I checked out the omnibus, and I needed a refresher to read the second. The book was written before Harry Potter, and the author's take on the magical world is thus unaffected by the mindset of the Harry Potter books. Instead of a escape into the magical world, this one is just as nitty gritty, full of courageousness characters, who need someone to step in and save them. The first novel is about Jacky, who is the latest "jack" needed to fight the giants and other bad fairies. Her best friend helps her, and she discovers a prince who also helps her along in her adventure. It ends with her joining the fairy kingdom, and everything is rosy. This book is a combination of two of de Lint's “Jack” novels – Jack the Giant Killer and Drink Down the Moon. The world is lots of fun – 1980s/90s Ottowa exists side by side with the realm of the fae taken more or less straight from European and Celtic folklore, with some fun modern twists. My favorite part, though, was how realistic the main characters were. When you talk about a Strong Female Character, Jacky and Kate are what it should mean: they are strong, brave, smart, and determined but a This book is a combination of two of de Lint's “Jack” novels – Jack the Giant Killer and Drink Down the Moon. The world is lots of fun – 1980s/90s Ottowa exists side by side with the realm of the fae taken more or less straight from European and Celtic folklore, with some fun modern twists. My favorite part, though, was how realistic the main characters were. When you talk about a Strong Female Character, Jacky and Kate are what it should mean: they are strong, brave, smart, and determined but also sometimes frightened or confused and they make mistakes. De Lint lets his ladies be human and as a result they are not only very realistic, but also easy to identify with. The same attention to detail goes into each and every one of his side characters, too, and I have no doubt even the minor characters have back story that could fill a novel themselves. This book is a compilation of two of Charles de Lint's novels: Jack the Giant Killer and Drink Down the Moon. It was my first foray into Charles de Lint's work and I was impressed. In Kate and Jacky, de Lint has written two very realistic women characters who are not only strong and brave and smart, but who are also occasionally scared, and confused, and who make mistakes. The result is a couple of really three-dimensional characters who were easy for me to relate to. The story itself is also qui This book is a compilation of two of Charles de Lint's novels: Jack the Giant Killer and Drink Down the Moon. It was my first foray into Charles de Lint's work and I was impressed. In Kate and Jacky, de Lint has written two very realistic women characters who are not only strong and brave and smart, but who are also occasionally scared, and confused, and who make mistakes. The result is a couple of really three-dimensional characters who were easy for me to relate to. This is a pair of novels, detailing the life of one Jacqueline Rowan. After her fed-up boyfriend leaves her, tired of her home bound ways, Jacky goes out drinking and stumbles on the world of faery, where a battle between the Seelie and Unseelie Courts has long been underway, with the dread Unseelie Court becoming stronger with every passing day. Jack is expected to be a hero but she’s just a girl…isn’t she? This was an exciting tale for me, one where a young girl rose up to become an unlikely h This is a pair of novels, detailing the life of one Jacqueline Rowan. After her fed-up boyfriend leaves her, tired of her home bound ways, Jacky goes out drinking and stumbles on the world of faery, where a battle between the Seelie and Unseelie Courts has long been underway, with the dread Unseelie Court becoming stronger with every passing day. Jack is expected to be a hero but she’s just a girl…isn’t she? I finished Jack of Kinrowan by Charles de Lint, which is divided into two stories -- Jack, the Giant Killer and Drinking Down the Moon. While I was impressed with de Lint's writing style, I thought he did a great injustice to the reader. Let me explain . . .
Jacky Rowan is the main character of both stories, yet her portrayal as the fabled Jack of Kinrowan is a disappointing one. Jacky makes stupid decisions, especially in Drinking Down the Moon, which leads her friend Kate "Crackernuts" Hazel to I finished Jack of Kinrowan by Charles de Lint, which is divided into two stories -- Jack, the Giant Killer and Drinking Down the Moon. While I was impressed with de Lint's writing style, I thought he did a great injustice to the reader. Let me explain . . .
Oo...kay. I was trying to add a review for _Muse and Reverie_, and it keeps giving me an entry for Jack of Kinrowan when I try to select that title. So...this is for _Muse and Reverie_...a good collection overall, even if de Lint's standby story lines of simple inner-city musicians encounter the magical is getting a little worn. I just wish he'd shown a little more creativeness with this volume. The only standout stories are "Somewhere in My Mind There is a Painting Box" and the story near the e Oo...kay. I was trying to add a review for _Muse and Reverie_, and it keeps giving me an entry for Jack of Kinrowan when I try to select that title. So...this is for _Muse and Reverie_...a good collection overall, even if de Lint's standby story lines of simple inner-city musicians encounter the magical is getting a little worn. I just wish he'd shown a little more creativeness with this volume. The only standout stories are "Somewhere in My Mind There is a Painting Box" and the story near the end that involves Hellboy. Clearly the latter must have been written for some sort of "guest anthology" for the comic character, but I found it a bit distracting in this volume. I really enjoyed the mixing of fairy tale into a modern day setting, though I felt I lost something of the modern setting by never having been to those cities since it made no difference to me where the Lord's Court was etc. Another thing I like about these books is the realistic, but strong female characters, and the good friendships. I enjoyed the plot of the first book and thought it was very nicely done. The second book, on the other hand, seemed to meander and never did what the blurb on th I really enjoyed the mixing of fairy tale into a modern day setting, though I felt I lost something of the modern setting by never having been to those cities since it made no difference to me where the Lord's Court was etc. This is an omnibus edition containing "Jack the Giant-Killer" and its sequel, "Drink Down the Moon." I'd read the first novel before, but not the second. Both concern two young human women – Jacky, and her best friend Kate, who turn out to be destined to be particularly useful to Faerie – the magical world which co-exists with our own, but which most people do not see. Although much reduced in modern times, the Seelie and Unseelie courts are still in conflict with one another – not to mention the This is an omnibus edition containing "Jack the Giant-Killer" and its sequel, "Drink Down the Moon." I'd read the first novel before, but not the second. One of the standards of “Urban Fantasy”. In medieval times, fairy stories were always set in a world next to ours, but with it’s own rules. Delint simply updates this to the modern era. Not a lot of surprises in the narrative, but that isn’t really the point. A good gateway into the Urban Fantasy genre, but probably doesn’t hold much that is new for people already well versed in that area. Silly, fun fantasy fluff. As usual, DeLint is overly earnest about incorporating his love of music, and loves to romanticize Native beliefs. Sigh. Also as usual: the storyline of feisty young urban woman who doesnt believe in magic BUT THEN SOMETHING MAGICAL HAPPENS TO HER! Totally formulaic, totally love it. Still, he does know how to tell an enjoyable story and it was a fun change from my academic routine. These stories were the first ones I read of De Lint and I knew I had found an author I would follow anywhere. So far, many years later, that has held true. This is Urban Fantasy/Urban paranormal, whatever you want to call it, at it's best. The characters are compelling and the city life blends seamlessly with the fantasy. These early tales are fairytale based but deLint expands in later books to include other mythologies. The first book was better than the second. I loved both, but the second was a bit disjointed, and the back cover description was way off. I found it strange that de Lint made a few references to the Native American spirits of his other novels, but never really gave detail to them. There were an awful lot of those references, too. All the same, it was neat to see his take on just the fairies, without other spirits around.